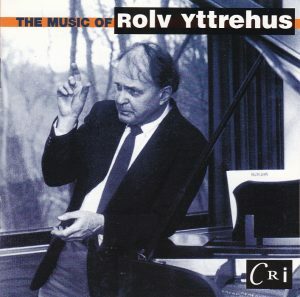 Until very recently I’d never encountered the name of Rolv Yttrehus. It is while I was compiling a discography of the Louisville Orchestra that I stumbled upon him (his Gradus ad Parnassum, reissued on the present CRI disc, first came out in 1982 on the Louisville LP LS-772, paired with Ginastera’s Jubilum (the latter now on First Edition Music FECD-0015, barcode 809157000150) and I first imagined that he must be Icelandic or something. Ah, the American melting pot! The man was born in 1926 in Duluth, Minnesota, just like you and me. He was a student of Nadia Boulanger, Ross Lee Finney, Roger Sessions and Aaron Copland and was himself professor of music at the Rutgers University. Some of the titles of the other pieces featured on this CRI disc also attracted attention: “Music for Winds, Percussion, ‘Cello and Voices”, “Angstwagen for soprano and percussion” seemed to point to an original approach to instrumentation. I was curious and decided to investigate it. 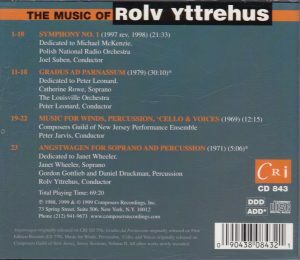 Well, listening to the music, I understand why Yttrehus is apparently such an obscure figure of the American compositional world. He avows Sessions and Schoenberg as his principal influences, and it is exactly what you hear. I view Sessions as an epigone of Schoenberg, but at least Sessions’ music is as rich and rewarding as that of his mentor and inspiration. Not so in the case of Yttrehus, the epigone of the epigone, as if the inspirational powers had tapered off along the line. I don’t know if the compositions are written in strict serial technique, but they sure sound that way: not as tedious as some Babbitt, and to someone familiar with the orchestral works of Schoenberg, it shouldn’t be very offensive. But it is simply that the music sounds like a cliché, even a caricature, of the compositional gestures of the serialists: dramatic, packed with sonic events, but also forbidding, unseductive, dry, a busy but seemingly arbitrary piling of intervals and timbres. And don’t take me wrong: I have a great fondness for the music of Schoenberg, and enjoy the symphonies of Sessions. And that’s the point: there is more lyricism (even in atonal garb) in their music, and the contrapuntal activiy I find richer and more interesting. In the genre, Gunther Schuller has also written a fine Symphony (see my review of American Orchestral Music on Vox). Likewise, Luigi Nono’s vocal writing, to which Yttrehus’ vaguely resembles, is much more lyrical and evocative. There is one aspect in Yttrehus’ compositions that I personally find fun, though. “Gradus ad Parnassum” is a long and rather tedious study on the Dyonisian and the Apollonian, e.g. how Art requires for the disciplines of the intellect to give organized form to the furious chaos of raw inspiration. The composition quotes taped improvisations made by the composer (Track 12 at 1:21 and track 17 at 1:53), in which he sings and plays the piano “in a wild, orgiastic, and gleeful manner”, according to his own words. It is so outlandish as to be hilarious, souding like the pounding vociferations of Hannibal Lecter devouring a victim, or the orgiastic barfing of an ogre. Yttrehus at the piano must fit the definition of a “Serial killer”, I suppose. I wonder what the Louisville audiences thought back then – I bet that concert must have precipitated the orchestra’s near financial demise in those days. On Track 13 at 0:53 there is also the unexpected, startling and vaguely frightening outburst of loud tape music – which, I guess, is exactly its purpose, as the movement is called “Apollonian Admonition”. There are interesting sounds on track 16, “The Descent to the Dionysian Substratum of the World”, with an electronic treatment of the lowest contrabassoon note. The same kind of effect can be heard in the “Music for winds” (track 21), in which a pre-recorded, vociferating voice suddently enters from silence in a loud crescendo, and disappears. But these moments are fleetingly short, and not enough for me to keep this disc in my collection. Too bad Appolo has taken the upper hand on Dyonisus, and a hackneyed Apollo at that. Quick come, quick go, fare well, Mr Yttrehus. And a post-script from September 2016: almost a decade later, nobody’s bought my CD of Yttrehus. Not that I blame those who didn’t. Jeez’, it turned out not to be such a “quick go” after all: once you’ve touched it, it’s like a curse, the Apollotic Dyonisian seems to stick on you eternally! For another possible musical evocation of Hannibal Lecter devouring his victim, and more entertaining and inventive than Yttrehus’ I find, try Bernhard Gander.